A homemaker, her family was central in her life. Services: Friday, January, 25, 2019 at 11:00 a.m.
Teresa V. Knighton, 91, of Columbia, passed away Sunday, January 20, 2019 at the Susquehanna Valley Nursing and Rehabilitation Center after a brief illness. She was the wife of the late James R. Knighton with whom she was married 65 years until his death in 2017. A lifelong Columbia resident, she was the daughter of the late Michael and Mary Branyik Buzzendore. A homemaker, her family was central in her life. 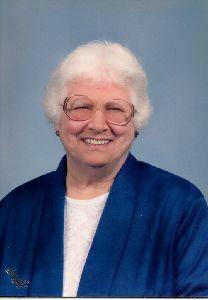 Teresa was a devoted member of St. Peter's Catholic Church, Columbia and enjoyed playing cards with family and friends. She is survived by her daughters, Mary Theresa, wife of Robert Kilheffer; Sandra Lee, wife of Charles Bink; five grandchildren; ten great-grandchildren; two great-great-grandsons; brother, Joseph Buzzendore. She was preceded in death by her siblings, George, Joseph, John, Jake, Betty, Anna and Mary. A Mass of Christian Burial will be held at St. Peter's Catholic Church, 121 S. Second St., Columbia, PA 17512 on Friday, January 25, 2019 at 11:00 a.m. with the Rev. Anthony Swamy, Celebrant. Burial will follow in St. Peter's Catholic Cemetery. Family and friends may view at the church one hour prior to the mass. In lieu of flowers, contributions in Teresa's memory to St. Peter's Catholic Church would be deeply appreciated.